To prepare crust, lightly spoon 1 cup flour into a dry measuring cup, and level with a knife. Combine 1/4 cup flour, ice water, and lemon juice, stirring with a whisk until well blended to form a slurry. Combine remaining 3/4 cup flour, powdered sugar, and 1/4 teaspoon salt in a large bowl, cup in shortening with a pastry blender or 2 knives until mixture resembles coarse meal. Add slurry, toss with a fork until flour mixture is moist. Gently press mixture into a 4 inch circle on 2 sheets of overlapping heavy-duty plastic wrap; cover with 2 additional sheets of overlapping plastic wrap. Roll dough., still covered, into a 12-inch circle. Freeze dough 10 minutes or until plastic wrap can easily be removed. Remove dough from freezer. Remove top 2 sheets of plastic wrap; let the dough stand 1 minute or until pliable. Fit dough, plastic wrap side up, into a 9-inch pie plate, allowing dough to extend over edge. Remove remaining plastic wrap. Press dough into bottom and up sides of pie plate. Fold edges until; flute. Transfer doug-lined pie plate to refrigerator. Making filling. 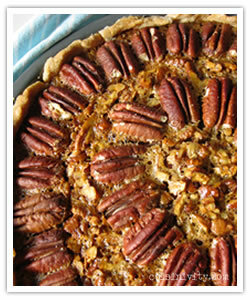 In a large bowl, whisk eggs, corn syrup, sugars, butter, vanilla, and salt until smooth; mix in pecans. Pour mixture into chilled pie crust; place pie plate on a baking sheet. Bake until filling jiggles slightly in the center when gently shaken, 50 minutes.